Nvidia today announced a voluntary recall program for its SHIELD tablet and SHIELD TV AC power adaptors. 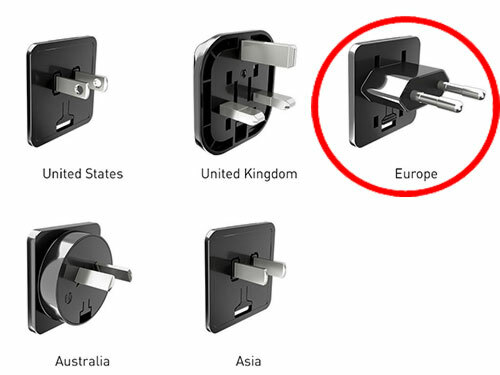 The component at fault is the two-prong European plug head – or 'duck head' which connects to the power brick to allow it to fit in European AC wall outlets. Nvidia has determined that it could break and pose "a risk of electrical shock". The recall is limited to that adapter component only. SHIELD tablet and TV users are advised to "immediately stop using the recalled European plug heads and contact NVIDIA for a free replacement". According to a CPSC press release there are about 7,000 affected units that need to be recalled. Nine reports of the Euro plug heads breaking have been received by Nvidia, the figure includes six customers who received electric shocks. Not all euro plug adapters need to be recalled for exchange, says Nvidia. The recall is for European SHIELD tablets and European SHIELD TVs shipped between July 2014 and May 2017. End users might not be reassured by that, if they bought a SHIELD TV in July, for example, so there are other ways to determine if your adapter is safe. If you check below you can see some further ways to visually confirm your adapter is safe or not. If you can see a punch mark in one of the last two triangles in row 16, your product is safe (upper two images left and centre). Furthermore, if your 'duck head' adapter has the letter B on the lower left corner then you don't need a replacement (above image right). Getting a replacement Euro adapter is easy and free and can be done via the form linked to in the intro paragraph. Alternatively you can call the Nvidia customer support teams, as follows; US (toll free): 800-797-6530, US: 408-486-2000, United Kingdom: 0800 404 7747, Germany: +49 (0)3030806888, France: +33 (0)975186797, Spain: +34 911880035, Italy: +39 0294757110, Poland: +48 (0)223975013, Russia: +74996092527. Use a schuko plug instead of that retarded EU/UK type. Hey, you leave UK plugs out of this! I believe that particular plug is of French origin. But yeah, should be a Schuko (German: Schutzkontakt) plug instead. The schuko plug has several variations. The French version has a protruding earth connection from the power outlet, so a standard schuko plug will not fit, although in practice, most schuko plugs will mate with either German or French types. The video points out many of the safety benefits of the UK plug, although one drawback is the square form factor of the pins. It is difficult to get a uniform contact over the entire surface area of a square pin, it is much easier with a round pin. A UK plug is rated at 13 amps, a Schuko at 16. Afaik, all high current connectors invariable have rounded contacts to reduce contact resistance and consequent risk of overheating.